So one of the most interesting things about coming to Mizzou has been getting to see what's popular at a different school in different part of the country. The first thing that I noticed about Mizzou was the way the students dress. 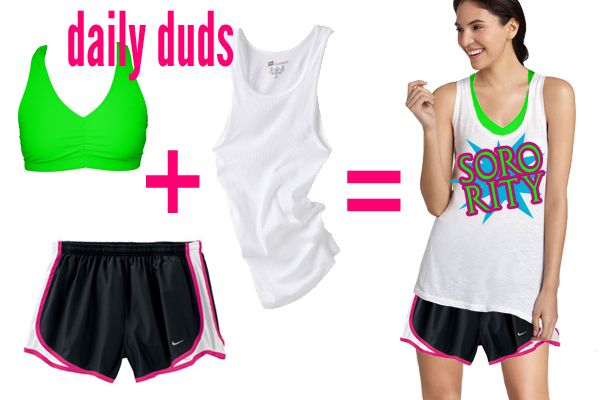 On the first day of class, approximately one million girls were wearing this number: neon sports bras, sorority slub tanks and Nike track shorts. My initial reaction was, "OH, so this is their hazing. They make the girls wear these outfits." But no. The first day came and went. And girls were still wearing this. It's like the thing to wear. On the one hand, I can see the logic in this wardrobe choice. For the first two weeks of classes, it was approximately one billion degrees on campus. On the other hand, I can't see the logic. Because they're going to class. With their sports bras sticking out. So if that's how the girls look, how do the boys look? They look bearded. I know what you're saying. You're saying, "Kate, they might look bearded, but they don't look like Jon Hamm and Brad Pitt." To which I say, "Au contraire, monsieur." Okay, actually not au contraire. You are right. (And you're probably not a monsieur.) They don't look like Jon Hamm and Brad Pitt. But they do look bearded, and I can't miss an opportunity to remind people that Brad Pitt and Jon Hamm went to Mizzou. And as long as we're speaking in French, want to know what else is rampant on Mizzou's campus? Amour de Apple. Seriously. I know that I posted this same Mizzou classroom picture back in February, but now I've seen this Apple love with my own eyes, and it still amazes me. Classrooms actually look like that. Also, the Mizzou campus is like one big iPhone-fest. It's not just the majority of kids who have iPhones. It is the vast majority. (I also see a surprising number of kids — undergrads, grads and non-J-School kids alike — traipsing around campus with iPads. They're all like, "No big deal. Just chillin' with my iPad.") It's like the future. Another thing kids love at Mizzou (and my favorite spot on campus) is the completely ridiculous — nay, opulent — recreation center, which everyone calls The Rec. I always go after my classes end, so I have it to look forward to all day. Going into The Rec is sort of like watching MTV's Cribs. It just seems like way more than anyone could ever need in the way of recreational space. Don't like the cardio theater? Go to quiet cardio zone. Don't like the locker room? Don't like the weight room? Go to the other weight room. Go to the other pool. Don't like the other pool? Go to the other, other pool. Don't like the other, other pool? Go to the sauna, ya whiner. GO GET YOUR TOENAILS DONE. IN THE REC. That little Q&A there just began to touch on all that there is in The Rec. I found out recently that The Rec was actually rated the number one recreational center in the country by Sports Illustrated. I'm not surprised. I still haven't tried it, but it is made on campus, and people love it. Everybody seems smart here. [I am like not even that special anymore. (Just kidding, bahaha.)] But, seriously, it makes sense that Columbia is the 13th most educated city in the country! Or at least it was in 2006. People love to swear at Mizzou. Profs swear at students. Students swear at profs. Profs swear in their lectures. Students swear in their homework. And it's all no big deal. No big deal, #$@% it! People also like to smoke on campus. I will never understand. People love this grocery store called HyVee. I went there, and I was all excited to experience it, but it turned out to be...a grocery store. There are so many Asians here. (Do you like how I represented them with a picture of Russell from Up? Thought so.) I'm pretty sure there are more Asians in the grad school than non-Asians. I pay $170 a year to park in parking garages, and I spend a lot of time in parking garages. They are taking over the city of Columbia, and there's still not enough parking. Wow, parking garages make kind of a lame note to end on. I should have thought of that when I was arranging my collage, but it is 1:12 a.m. now, and there is no way that I am opening up Picasa to rearrange that and make a better conclusion for you guys. Has journalism school taught me nothing!? p.s. I'm starting a new series on my blog called "Grammar with Kate." Clever, right? No, not right. If you can thing of a better name, let me know. It will be a grammar series inspired by pop culture happenings. First topic of discussion: Lady Gaga's new song "You and I." So much is wrong with that song. (Grammatically and otherwise.) Get excited.